Giovanni Guiliano, 2, endures a vaccine while sitting in the lap of his dad, Joe Guiliano. Medical student Meytal Shtayer administered the immunization at a Tot Shots clinic at the Community Food Bank. Giovanni's sister, Jasmine Justes, 5, right, already had received her shots. 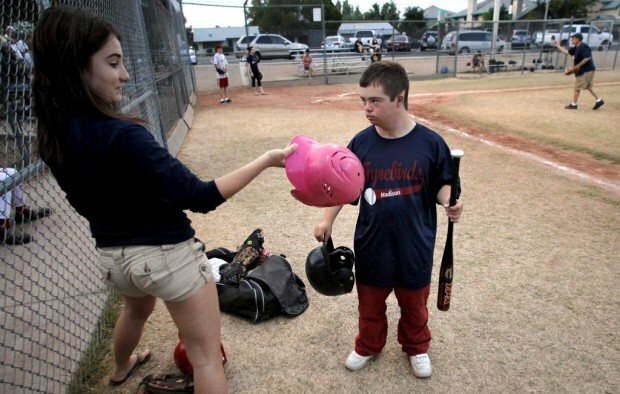 Sydney Humble offers her older brother, Luke, a choice of batting helmets before his turn at the plate during a baseball game at Madison Rose Lane Elementary School in Phoenix. Luke developed a case of chickenpox despite being vaccinated against the disease. Natalie Norton and her son, Gavin, in 2009. Gavin died of whooping cough as an infant, which is when many children are most vulnerable because they've yet to be vaccinated. One in three Arizona schools last year had kindergarten classes with vaccination rates so low children were left vulnerable to infectious disease outbreaks such as measles, mumps or pertussis, an Arizona Daily Star investigation has found. By far the worst offenders are charter and private schools, some with vaccination rates as low as 50 percent in Pima County and under 30 percent in Maricopa County. Rates need to be 80 percent to 95 percent, depending on the disease, to prevent the spread of infection. The largest numbers of unimmunized children attend schools that fail to enforce state requirements that students either be immunized or have a personal-belief or medical exemption. Schools are supposed to suspend students who aren't immunized, but other than sending letters, the state has taken no action. The health and education departments each said the other was responsible for enforcement, and the law doesn't spell out consequences for violators. The more people in a group who are vaccinated, the better protection for the weaker among them. High vaccination rates help prevent the vulnerable from being exposed to infectious diseases. Infants too young to be immunized face the biggest risk from an unvaccinated population because their small bodies can easily succumb to an aggressive bacterial disease like pertussis, also known as whooping cough. High vaccination rates also protect people with conditions such as Down syndrome, whose weakened immune systems make them vulnerable despite vaccinations. Finally, high rates protect those whose vaccinations did not work, which for a disease like pertussis can be as high as 20 percent. "It's a very real risk, choosing not to vaccinate," said Natalie Norton, whose newborn son died of pertussis in January 2010. "It's like playing Russian roulette with your own children, and with everybody else's." Twenty-nine percent of schools in Pima County had levels of at least one vaccination fall below the threshold that curbs the spread of infectious diseases - what's called herd immunity - for the 2010-11 school year. That's the latest data available from the state. For the previous year, it was 31 percent. The rates were worse in Maricopa County - more than one in three schools fell below safe rates in both school years for at least one of three major vaccinations. They are polio; DTaP, which prevents diphtheria, tetanus and pertussis; and MMR, which protects against measles, mumps and rubella. Medical experts say safe herd immunity for DTaP is 90 percent, MMR is 95 percent and polio is 80 percent. Dozens more schools have rates below safe levels, but the state is keeping their names secret. The Arizona Department of Health Services refused to release complete data for schools with fewer than 20 kindergarten students because it said parents could figure out how to identify unvaccinated children. The state provided vaccination data from those schools, but redacted their names. Based on the data provided, it's clear the schools are highly vulnerable to disease outbreaks. More than half fall below safe vaccination levels. The problem is growing because more kindergarten students are coming to school unvaccinated and staying that way, despite more outbreaks and deaths from vaccine-preventable diseases. Measles in the U.S. reached a 15-year high in 2011, said the U.S. Centers for Disease Control and Prevention. A Phoenix baby too young to be immunized died of whooping cough in late April. A Gilbert school forced its unvaccinated children to stay home for a month in February after two students contracted mumps on a trip to Canada. A 36-year-old Swiss tourist with measles led to an outbreak in 2008 that began at Northwest Medical Center and cost $800,000 to contain. Desert Marigold, a Phoenix charter school, had a whopping cough outbreak in December with eight confirmed cases and many more suspected by Maricopa County health officials, who nearly shut down the school. Desert Marigold had the second-worst vaccination rate in the state in 2010-11. Less than 30 percent of its kindergartners were vaccinated for MMR, polio and DTaP, which helps prevent pertussis. Desert Marigold Administrator Charles Burkam said he didn't "necessarily see a tie" between the rock-bottom vaccination rates and the outbreak. Natalie Norton will never escape the devastating consequences whooping cough had on her family. Norton, a 30-year-old Phoenix photographer, says she and her husband, Richie, suffer each day. In late 2009 the Nortons were living in Hawaii with their four boys. They decided to go to Utah for the holidays, and Natalie got the go-ahead from her newborn son's pediatrician to travel. Not quite eight weeks old, Gavin Norton was too young to be immunized against whooping cough. He was scheduled to have his first shot when the family returned from vacation. Infants are among the most vulnerable to whooping cough. Children and adults who aren't vaccinated might not get sick themselves, but they can pass the illness on to babies like Gavin. Shortly after Christmas, Gavin began coughing. "It was one cough here, another cough there. We decided to take him to the ER - he hadn't been eating well, and we were concerned about dehydration," Norton said. "I truly just believed they would give him some fluids, and they would send him home. When they decided to admit him I was very surprised." Gavin was transferred to the pediatric intensive care unit, and his condition worsened. "We got a positive test for pertussis, and from there it was a very quick decline," Norton said. "We sang to him, and we spent as much time right at his side as we possibly could." Richie Norton put his hand on his son's chest and felt for the last beats of Gavin's heart. "And within moments, he was gone," Norton said. "We left the hospital with empty arms. We had to leave him there and go back to the reality that we were not whole." Norton now advocates for childhood immunizations against pertussis and urges adults to make sure they are up to date, too. "I never thought this would happen to my family," she said, "and yet, here I am, two years later, still trying to pick up the pieces of my broken life." Cases of whooping cough have increased in Arizona and nationwide. There were no pertussis deaths in Arizona between 1991 and 2002. But since 2003, there have been six. There were 11 times as many cases of pertussis in 2011 as in 1991. Deaths are up elsewhere, too. Ten infants died of whooping cough in California in 2010 alone. Children who have weakened immune systems - those with cancer or Down syndrome, those who are organ transplant recipients or take intensive medicine like steroids - are also vulnerable. Older kids who aren't vaccinated can bring home diseases like whooping cough to their younger, more susceptible siblings. "You are vaccinating your kids so that you protect your community. It's a community responsibility - it's a social contract," said Will Humble, director of the Arizona Department of Health Services. Humble said some children, like his son Luke, who has Down syndrome, have fewer antibodies to fight off disease. That's why Luke, 18, came down with chickenpox even though he'd been vaccinated against it, Humble said. "He's the kind of person that we need to vaccinate everybody for," Humble said. "It's about community protection, not personal protection." By far the worst offenders with unsafe vaccination rates - in Pima County and statewide - were charter and private schools, the Star's investigation found. The cause is not parents signing waivers to opt out of vaccinations. Rather, it's schools letting kids come to class unvaccinated. In other words, schools are not following the state law that requires immunizations or a waiver. Eight of the 10 worst schools in Pima County for vaccinations in 2010-11 were charter or private schools. The Academy of Tucson Elementary and the Academy of Math and Science on Prince Road had the worst vaccination rates in Pima County last school year, with less than 60 percent immunized for multiple vaccines. The state's data showed some Pima County public schools in lower-income areas below safe levels in 2010-11 - but still much higher than many charter schools. Those public schools said they got their rates above 95 percent over the next few months through a combination of parent education and diligent enforcement. Charter schools, by contrast, did not report similar improvements or raise rates to safe levels. The Star found the key to higher vaccination rates is for schools to require parents to show proof upon enrollment and then to follow up with noncomplying students. A school nurse helps, but what schools really need is a commitment to vaccinate. Deborah Bryson is the principal at Desert Willow Elementary in the Vail School District, which has one of the best vaccination rates in Pima County. She said the school won't let children register without meeting state requirements. There is a grace period, but the staff gets more aggressive with each follow-up, requiring the date of the doctor's appointment and then finally telling kids they cannot attend school. Bryson said she's never had to exclude a child, however. The Academy of Tucson, questioned by the Star about its low vaccination rates, said it will adopt many of these procedures next year. But at Khalsa Montessori School, which had low vaccination rates for both years the Star examined, the philosophy is that vaccines are "a parent's choice," said Director Nirvair Khalsa. "The school's job is to collect the data and report it," Khalsa said. At the Academy of Math and Science, front office manager JoAnn Belvedere said it's difficult to get some parents even to just sign the waiver. "Some of them get very indignant. ... There's not much you can do when your parents don't comply," she said. Belvedere said all she needs to do is get the rates above 75 percent. She's wrong - that's below herd immunity for all diseases. Dr. Bob England, director of the Maricopa County Department of Public Health, said charter schools are low for two reasons: They usually don't have a school nurse, and they have a higher percentage of alternative-minded parents who believe in natural medicine. Desert Willow Principal Bryson noted that charter schools face enrollment pressures that could contribute to lower rates because they don't want to lose students who fail to comply. England almost sent home 70 percent of Desert Marigold's students during the pertussis outbreak in December because they were unvaccinated. Unlike most schools with low rates, Desert Marigold makes its parents sign a waiver and has only a small percentage of students who don't comply with state law. Burkam, the Desert Marigold administrator, said low rates could be because it is a Waldorf school. Waldorf parents spend quite a bit of time informing themselves and don't just take the word of authority, he said. "They make up their own minds." Schools that fail to comply with the vaccination law don't face any consequence. No one is enforcing the law. The two state departments responsible for vaccinations - Health Services and Education - point at each other while children go unvaccinated. State law says students cannot attend school without full immunizations or a waiver. Students without either are supposed to be suspended. "There is absolutely no consequence to a school if they report or don't report at all," said Dr. Michelle McDonald, chief medical officer for the Pima County Health Department. "You have no idea how much work this is, to go to all these schools and get this data. ... To not have any consequences for that work is kind of galling." Health Services collects immunization data from counties, but department officials said enforcement is up to Education. State law doesn't say that. Health Services sends a letter to schools with vaccination rates below 80 percent, but it does not say what will happen if the school doesn't raise the rates. Neither department can remember a school being sanctioned over vaccinations. Education spokesman Ryan Ducharme said the law is silent on what to do if schools don't suspend students, meaning there is no teeth to it. McDonald said county health departments are powerless. "The county Health Department has no authority to tell a school to do anything," she said. "We can educate until we are blue in the face, and that's really all we can do." Tucson naturopathic physician Tevna Tayler doesn't vaccinate her two children, and said she does not worry about them contracting vaccine-preventable diseases. "I felt like the potential risks outweighed the benefits," she said. "You can die from anything, but I'd rather naturally boost the immune system. In what natural world do you get injected with a strange concoction?" She is one of a growing number of parents who fear health repercussions from immunizations. Some say there are too many vaccinations. Others believe vaccinations cause autism, although that link has been discredited by leading medical journals, the mainstream medical community and the U.S. government. Dr. Sean Elliott, a pediatrician who specializes in infectious diseases at the University of Arizona Medical Center, said vaccinations are in some ways a victim of their own success. People have forgotten the viciousness of the diseases they prevent. "People forget what real measles looks like, and the fact that it can be fatal. They forget what mumps looks like and the fact that it can cause sterility in men and be fatal," he said. The last six cases of pertussis Elliott treated were all infants below 2 months old, too young to be vaccinated. Infants typically have prolonged intensive care stays. Some are hooked up to an external lung. Elliott has watched babies die. "It is horribly tragic," he said. McDonald said a school with only 75 percent of its students immunized is not much better than having only 25 percent vaccinated. Schools and classrooms are "microuniverses," which is where many outbreaks occur, said Dr. Karen Lewis, medical director for the state's immunization program. "What really protects you isn't so much the vaccine you get: It's the vaccines the people around you get," Maricopa County's England said. "It's crucial in a school to keep the herd immunity high." Chat with Star reporters Rob O'Dell and Stephanie Innes about this series at noon MST Tuesday. They will also welcome your ideas and questions for future stories about why so many Arizona parents are not vaccinating their kids. Figures reflect percentage of students vaccinated in the 2010-11 school year. Percentages in parentheses under the vaccines are considered safe levels. Contact reporter Rob O'Dell at rodell@azstarnet.com or 807-8465. Contact reporter Stephanie Innes at sinnes@azstarnet.com or 573-4134. Public service is an important part of the Arizona Daily Star's mission. Star reporters Stephanie Innes and Rob O'Dell chatted live about how unvaccinated kids threaten all of us. A Star investigation found that one in three Arizona schools have vaccination levels that are below safe levels that prevent an infection from developing into a full blown outbreak. The Star has built two databases, one with two years of data for Pima County and another of all the schools statewide for the 2010-11 school year. The Arizona Department of Health Services has withheld data for schools with under 20 students in kindergarten, because officials fear the unvaccinated could be identified. The database of the state includes Pima County and has information on exemptions filled out by parents with a personal, religious or medical reason not to vaccinate. The Star investigation found the largest number of unvaccinated children come not from exemptions, but from schools not following state law requiring that kids either be vaccinated or have exemptions. Nothing is being done to schools that don't follow the law.